Direct Communications, where do we start? Being the only wired Eagle Mountain Internet service provider, you either love or hate Direct Communications. They are the oldest and biggest internet provider to Eagle Mountain. They are well established and very well known. They are originally an Idaho company that purchased Eagle Mountain telecom to build upon that existing network. They are the only wired provider in Eagle Mountain offering fiber to some lucky residents. While the quality of their service is questionable, you can achieve speeds up to 50 mbps. Most users say that they get these speeds during late times in the night when no one else in on the network. Our personal experience was a bad one. The internet speeds would fluctuate so often and so much that the average speed a 20 mbps subscriber was getting during a 24 hour period was around 7 mbps. That was unacceptable in our book so we called tech support. Their level one tech basically told us to restart all the equipment in the house. They claimed they saw no issues on their end and started to blame our equipment. This was interesting because we had just finished testing InnovativeAir’s 100 megabit line and achieved 93 mbps on this exact same set up. So we knew it wasn’t an issue on our end. Level one could not figure out the problem and we were asked for a good contact number to be reached so a level two tech could call us…. the next day. Needless to say, we have jobs and missed the call the following day so the issue was never resolved. 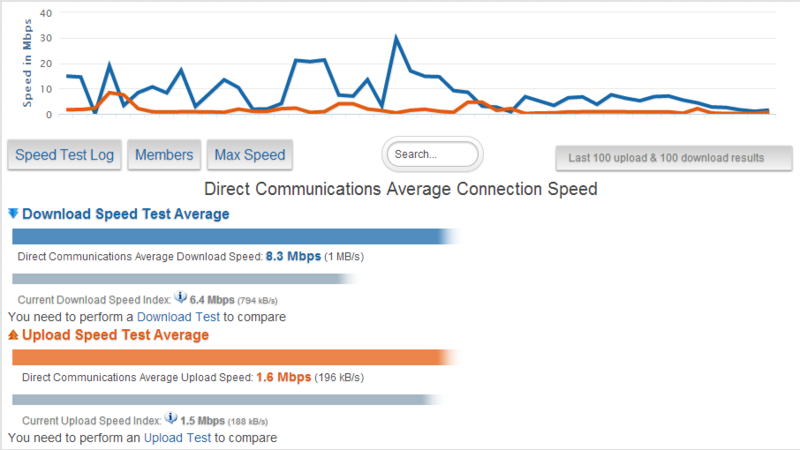 Using data from testmy.net (a third party speed testing site) we’ve generated these graphs. Hands down, they are the most expensive Eagle Mountain internet provider. When you compare the average speeds you’re actually getting to the price you’re paying. It becomes one of the most expensive internet service providers in the state! Their 20 mbps package (after taxes and modem rental) comes to $73 / month. And you will most likely not get a consistent speed of 20 mbps. They also do not guarantee their speeds, so complaining will not help. You will have to sign a contract when getting service with Direct Communications. They are usually for 2 years and sometimes include a great deal like a free Xbox, iPad, or something of good value. So make sure when you sign up that there is some sort of deal being offered. Otherwise wait. Direct Communications is very involved with the Eagle Mountain community, often donating over-sized checks to schools and other organizations. Way neat. Love this about them. That being said, it does not make up for the level of service they claim to provide. Your internet will go down. It will take a while to get fixed. You will have issues with your advertised speeds. They will not take fault for these speeds. When you’re finally done with them, you will be forced to finish out your contract. So be careful. There are at least 3 other offering Eagle Mountain Internet that would LOVE your business and prove to you every day that you are valued. With service guarantees, no contracts, and promises they will keep. While many people have great experiences with Direct Communications, there are a handful of people that have absolute nightmares. Trust us when we tell you this – There are better options. This should be your last resort if no other Eagle Mountain internet service provider can provide you service. They have also been known for bribing current customers for reviews abusing review systems like Google and Facebook. If you would still like to get service please visit their website at www.DirectCom.com to contact them. Their billing and customer service causes more headaches than they are worth. Internet was fine though their routers have terrible range. Automatic payments dont work with this company.. Expect them to screw it up and charge you reconnection and late fees and blame YOU for their terrible system. Since the fiber upgrades speeds have been reliable and no congestion. If they didnt have a monopoly on non-wireless in Eagle Mountain then maybe competition would make things improve. For those asking why the low ratings, perhaps it is because people feel trapped because they can’t switch to another non-wireless company. You don’t get the speed you pay for, and when you try to communicate with them about it, best case scenario is they keep telling you it is your wireless router, even if it isn’t (example: connect through a router, with everything completely wired with cat6 and no wireless transmitter, still don’t get the speed you paid for.) Worst case is they do this PLUS are very rude and impatient. They don’t seem to get the rules of tact in customer service. I have had direct communication for 5 years. The customer service is exceptional. I would recommend to all my neighbors. Getting download speeds around 70mb/s, upload around 30mb/s. I check other services in our area, and to get something remotely close charges about $50 a month more, so I’m not sure why all the bad reviews. The service is pretty reliable with an outage here and there, but what internet provider never has outages? The customer service is quite good when I call. I rate a 4 star because internet should be cheaper and faster. The rest of the world is ahead of us and the only way for us to catch up is if the internet providers would stop nickel and diming us for crappy speeds. We know you’re capable of better, so stop holding out. The worse internet in the world. I’ve had dial-up faster than this. If you are wondering if you should use them, DON’T. Worst service, speeds, and price. Bar none. Unfortunately DirectCommunications has been our only option for internet. There are others that are basically across the street, but for some reason, they’re just out of arms reach where we’re at. I’ve only used Comcast as a high speed internet provider, so I don’t have anything else to compare to. DC has been okay. I always feel like there is a better deal out there with my name on it though, something with better reliability, price, and speed. Overall, I’d say DC is average. We have disconnections a few times a month maybe. Speeds are inconsistent. Price, obviously seems too high for what we get. I haven’t had issues with their support though. I think they’ve been pretty good about that. They know their stuff and do a good job walking me through the steps to get things working. 2 stars, not for the service. People I deal with at the office are excellent. It’s 2 stars for the price. An issue that I have with this company is the pricing scheme. Now, I know DirectCom is not Google, but for whatever reason they’ve decided to not offer G-bit symmetrical+TV+VoIP to the home at $70 a month, instead charging us over $100+ for 30 meg UP AND DOWN?! I have rental properties in Provo that just got hooked up to the Google Fiber goodness. All 4 of them in different neighborhoods, roughly 4 1/2 miles apart from one another were hooked up with the Gigabit+TV service ON THE SAME DAY. 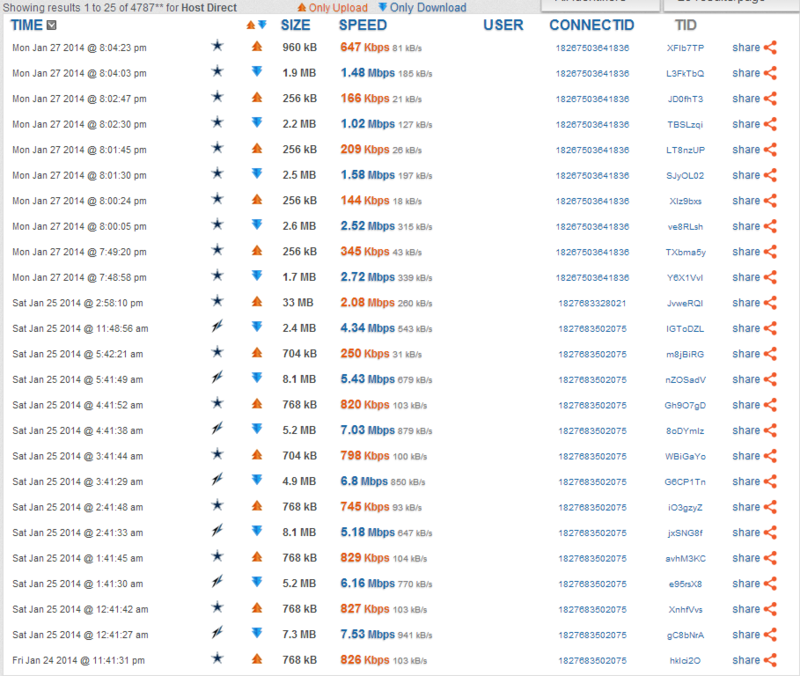 I’ve worked in the Datacenter+Telecom industry for years, and this is the service we get out here in Eagle Mountain? One of those 4 properties in Provo is starting to look more enticing as a new home, since this place can’t get anything right. With all the scandals and crap out here, I am not surprised that a Telecom can’t keep up. Even Xmission and many other providers on the Utopia fiber network are offering Gigabit for less than the cost of the 50/50 meg service. If they cannot change their ways soon, I will work my *expletive* off to convert my block to SignalWest or InnovativeAir before moving down to Provo to engulf myself with the delicious gig speeds. Google has also approved the use of homelabs, aka home Datacenters, on their network. DirectCom also allows this, but the cost per speed/performance is just too dang maddening. Google is a tech giant, but they aren’t screwing their customers into oblivion. Also, if any of you employees reply to this, stop using the excuse that Google is using G-Fiber as an app testbed. I do development work on the Google App engine and have asked the Google employees at the provo office if they planned to use this as a testbed for any application dev. Simple answer? Hey Google, why are you offering such an insane amount of speed? Is the network already in place to handle 10 Gig symmetrical? Kind of ridiculous, don’t you think? I can tell you all now, it is not entirely the companies fault. You have to also blame the main uplink (whom DC Rockland-Idaho also owns) called Syringa Networks. Before the huge mess that we found ourselves in, we were running on a backbone with a more established network, and if we look even further back, Level-3 had it’s hand in the pt at one point. Gone are the golden days of pushing for more reliable service. Another issue that I have with this company is the pricing scheme. Now, I know DirectCom is not Google, but for whatever reason they’ve decided to not offer G-bit symmetrical TV VoIP to the home at $70 a month, instead charging us over $100 for 30 meg UP AND DOWN?! I have rental properties in Provo that just got hooked up to the Google Fiber goodness. All 4 of them in different neighborhoods, roughly 4 1/2 miles apart from one another were hooked up with the Gigabit TV service ON THE SAME DAY. I’ve worked in the Datacenter Telecom industry for years, and this is the service we get out here in Eagle Mountain? One of those 4 properties in Provo is starting to look more enticing as a new home, since this place can’t get anything right. With all the scandals and crap out here, I am not surprised that a Telecom can’t keep up. Even Xmission and many other providers on the Utopia fiber network are offering Gigabit for less than the cost of the 50/50 meg service. Having owned and ran my own business, and being a corporate professional myself, I like to give businesses the benefit of the doubt. I especially like to support business who do so much to support the community. However, when a company does nothing to try to remedy a problem, I can no longer give them the benefit of the doubt, nor patronize them with my business. And that has been my experience with DirectCom. I really liked that they were local and I wanted to do business with them. But when my service would go down, the first-level support was completely useless (and more than usual). And they would escalate it to a technician who usually wouldn’t respond for at least a couple days. And, if it happens to go out on a Friday, you are out of luck until AT LEAST Monday. And what makes that even worse is that an outage isn’t a rare thing. And they will repeatedly tell you it is your equipment. I have brand-new top of the line Cisco enterprise-grade equipment. I didn’t buy cheap crap! Further, when you call customer service and they are rude. At least they have a chat option now, so I don’t have to hear their snarkiness. They seem to be friendly (or at least cordial) enough on the phone. With how I use the internet and what I use it for (work and school), I need a consistent connection and one that I won’t wait several days to get fixed like it’s not big deal. For some of us, this is our livelihood! DirectCom should know that seeing the demographic of Eagle Mountain. Since I can’t rely on them, I have to use a secondary provider (Verizon Home Fusion Broadband) for the times it goes down. My secondary connection is more than twice the speed (and in no way twice the price). The only reason it isn’t my only service is because with how much we use it, we’d be WAY over the usage. Some people seem to think they are alright, so it probably depends on what you use it for and how much. It also depends on if you are on copper of fiber. Which, we won’t get fiber anytime soon. If you want to try them, I HIGHLY recommend you DO NOT sign their contract. They won’t keep up their end, but you will be stuck. My oh my, what an experience I had with Direct Communications. I will preface this review by stating that I would only recommend DirectCom to someone who wanted to have constant problems with their internet. I signed up in July 2011, and from the very beginning I had issues with the speeds I was supposed to be getting. I couldn’t stream video above 480p, and couldn’t download anything after than about 300-400 KB/s on a consistent basis. I subscribed to their 20mbps down 2mbps up package. For the entire first year of my 2 year contract (Huge mistake signing that) I only saw 20mbps speeds between the hours of 2AM and 7AM. From 7AM through the entire rest of the day I would see my speeds drop by 75-80% of what I was paying for. When I contacted support, I got the standard BS, restart your modem, router etc.. When that didn’t do anything, they moved on to blaming my equipment for the problem, saying it was a problem with my router, switches, PC, and even my CAT5e home wiring. It was completely infuriating to have constant issues that they were trying to pass off as being caused by me. They refused to do anything about it until I gathered information on a daily basis, and provided it to them during a recorded customer focus group. At that meeting, I was told they probably would not be able to fix my problem, and that all they could do was lower my subscription to the 8mbps package (as that’s their lowest speed available), but I wouldn’t be released from my contract, despite their complete and utter failure to offer anything even resembling decent service. I decided to contact KUTV’s Get Gephardt to investigate DirectCom. They must’ve gotten wind of that because all of the sudden, they “Upgraded the software on their switches” and I all the sudden got perfect speeds… for a few months, long enough for the Get Gephardt thing to die. Then my speed issues slowly crept back in, and I found myself with daily slowdowns yet again. Now when it comes to their support, it gets worse than just being told that everything was my fault. Their level 1 techs are less useful than trained monkeys. They literally know enough to read from a script telling people to run a speedtest and reboot their equipment. After that, it’s off to level 2. Half the time I never even heard back. One time in particular, I called reporting a complete outage at my home. It was escalated to level 2 who sat on the issue for TWO AND A HALF freaking days before getting back to me and finding out the issue was on their side and fixing it. So I was down for about 3 days before anyone even troubleshot the issue. Unacceptable. My opinion of this company’s product, their service and support, as well as their relationship to the customer could not be lower. The way they ignore glaring issues that multiple people report, the way they blame their network’s faults on customers, and their self righteous attitude when dealing with any kind of complaint, and lastly their blatant false advertizing of providing consistent, constant fast speeds, and being able to stream anything you want, and clearly failing to provide even a fraction of what they claim to. Their network equipment is obviously over-saturated, and cannot provide consistent service to everyone. My two years with them could not have ended soon enough. I was all to eager to switch away from them. I highly recommend that anyone who values consistent speeds, and good service to avoid Direct Communications. In my opinion, they are the Yugo of ISP’s. This company would not own up to what they offered at the beginning of the contract and when confronted, their customer service was extremely poor. They presented the “offer” as a “trial” for a month, but they fail to tell me that they will prorate the connection. How do you prorate a “trial offer”? Isn’t trial implicates testing, if you don’t like it don’t buy it. This is what the dictionary says: Noun The act or process of trying, testing, or putting to the proof; test Poor company business practices and poor customer service. Poor service and slow speeds. I would not use Direct Com again. You don’t get what you pay for! We are paying for the 14MB download speed. For over a week now, I’ve checked our speed on several different bandwidth test websites and we are barely getting 2MB. I have called tech support several times, but the only response has been a voice message stating those bandwidth sites are not reliable. Tech support is no help. I tried to watch a 2 minute video on CNN and it buffered 8 times. Fair, definitely not great. I like the fiber optic DSL they provide, its fast.. but occasionally the internet will go down more often than internet connections probably should; it can go down at the most random times for about 2-12 hours! It also doesn’t help to have a member of the family who works from home.. obviously, the job REQUIRES an internet connection throughout business hours, yet Direct Communications do not seem to take this idea into full consideration. I have had to use the Tech Support phone number a few times, but each time has always been a hassling experience rather than a friendly one. Don’t even get me started about their technique to “bypass the router” in-case of a router connection failure; a troubleshooting process which is made to be an inevitably ridiculous process, at least for someone like me whose router was installed in such a way that it literally DANGLES about 5′ feet off the ground from several different cords & cables. Due to the very short and intricately tortuous ethernet cable they provided to my router during installation, this troubleshooting process was NOT a very easy task to complete alone AND without a portable computer. Again.. they don’t seem to take the customer into consideration; assuming the customer has 24/7 access to these things is just plain careless. WORST COMPANY EVER!! I pay $80 a month for internet and it is constantly down!!!!!!!!!!!!!!!!!!!!!!!!! Great service, great speed, and very reliable. I’ve only had to call 2 or 3 times for customer support, and they quickly fixed whatever issue I was having. Unfortunately Direct Communications has absolutely no competition – not in the good way, as in above all others, but in the bad way, as in no one else to compete in the market. They are completely unapologetic of the fact that if you rely on your Internet connection, they are your only choice. Don’t get me wrong: when it is working, it is pretty fast. Unfortunately it is common that the family has to stop watching Burn Notice in the evening because the download speeds have dropped to 1% of normal and netflix is unavailable. It’s probably a good thing that it gets our lazy butts off the couch, though sometimes it gets frustrating, evening after evening, to have a service that should be invisible simply stop working. I’ve contacted Direct Communications and their response has always been for me to contact technical services. I’ve tried that, and by the time they answer the phone or call back, the technical issue is gone and speeds are back up. Occasionally I will find out that they are, “doing work in my area”, though it seems weird that it would happen so consistantly in the evening, just when bandwidth usage is likely to peak for households. If you live in Eagle Mountain, you will get your Internet here, you simply don’t have a choice otherwise. The ladies in the front office are fun and sassy, though they aren’t well informed of the technical side of the house. My experience with Direct Communications has been great. I am not sure where the information in the article came from but they are currently offering free internet installation with a 6 month agreement. I am on Fiber and the speed has been exactly what they said it would be. The price is very reasonable considering that it comes with a phone line for me to use as well. I think it is a great value for the money and just about the same or a little bit less then other companies I have looked at. This email s obviously a face reply by DIrectcom for damage control. They never even listen a price. Really, a great value? What do you pay, and what are your speeds for Internet?. I’m on Google Fiber and I get 1000Mb speeds for only $70 per month WITH NO CONTRACTS! Reasonable… Whatever. 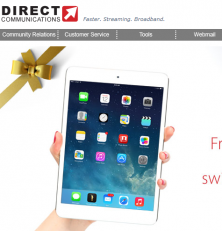 DIrectcom is a group of thieves! I’m experiencing Internet down time yet again. This seems to happen every month at the beginning of the month. I talk to tech support and they put me through the usual nonsense of resetting the router, etc. only to push me on to the people at the next tier of support who seem to work only when it’s convenient. Several days later my Internet is back up. I would say I have at least 3 days of downtime every time this occurs. It’s the same problem every single time! Apparently the fix is for the upper tier guys to do a connection reset on their end and then I’m up and running. Why does it take so long to do this?! Why does this even happen!? These are questions that Direct Communications doesn’t care to answer. They must have more important things to worry about. Avoid this company at ALL costs! I’m locked in a contract, but I’m cancelling anyway. I must live in a black hole. My internet is always slow. I can not get the speeds I pay for. The contract is BS. If you’re not providing the level of service you promise then why should I have to hold up to my end? Eagle Mountain ISP – Who Are We? We are a group of internet "power users" that know what makes an internet company good. Some of the team are programmers, system admins, server techs, and gurus in their field. We know that choosing an internet company can be hard. That is why we created this site. Please take some time to interact with your fellow Eagle Mountain Citizens. Share your stories. Get the info you need to pick the right internet provider for you. Thanks! Hope to see you again soon!